Meet Esmeralda. She’s been in my life for 3 days now. I’d like to say that we hit it off right away, but I can’t. I can’t even say that we have a love/hate relationship. Instead, it seems as though we’ve settled into some sort of twisted Junior High rendition of “You’re nice an’ all, but I hate you anyway” relationship. Esmeralda: She’s nice an’ all, but I hate her anyway. You see, she is really nice. She’s lightweight, smooths out the bumps in the roads, and is very shiny. Sources (i.e. 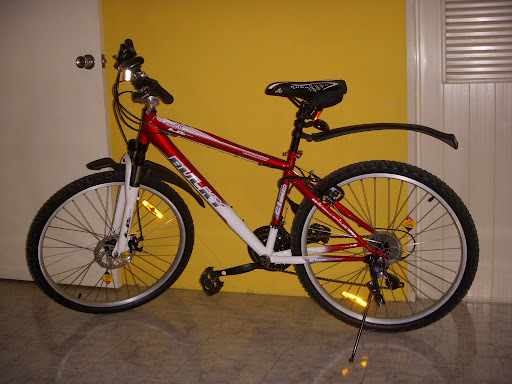 a Google search for ‘what the heck should I look for when buying a bike?’) tell me that she has good brakes, and other fine qualities. I’m sure if we had met under other circumstances, (like if she was someone else’s bike) we would have gotten along famously. In fact, I really liked her when we met – as long as she still belonged to the bike shop. However, just minutes after making the purchase, she reminded me that she was, in fact, a mountain bike. Mountain bikes and I have had our moments. I’ve explored the volcanic Korean island of Jeju on a mountain bike (making up many new curse words along the way). I’ve seen the Cambodian countryside and the splendors of Angkor Wat on a mountain bike (what a delightfully flat country!) More recently (yesterday, in fact) I discovered a friendly northern Thai sausage vendor because I was on my mountain bike. It hasn’t been all bad. In fact, coming home today, with a bag of recently purchased sour-pork sausages dangling from my handlebars, I came close to reconciling my relationship with Esmeralda. As I glided smoothly along my lane, a super decked-out uber-cyclist came from the opposite direction. He looked completely at home on his mountain bike, while I was still feeling like a bit of a cycling fraud. Apparently, he didn’t realize I wasn’t really a mountain biker, because he rang his little bell and smiled at me, as though we really were fellow travelers in a mountain bike world. A warm glow enveloped me, and I smiled broadly, thinking maybe I really did belong…then I nearly ran myself into a bush. I wonder what’s become of this sweet ride. Seriously, look at the chain guard. It says ‘sweet’. So, if anyone wants to take Esmeralda off my hands, and save her from a litany of imaginary curse words in the coming weeks, give me a call. She’s for sale. 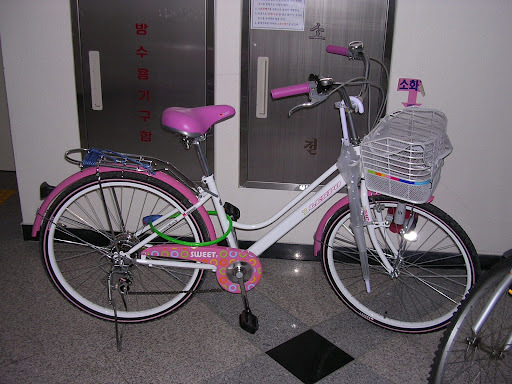 This entry was posted in General Musings, Korea, Thailand and tagged bicycle by Janice Hillmer. Bookmark the permalink. Janice, I never knew you had a blog but glad I do know now and I loved your entry today. I like Esmerelda actually. I'll enjoy hearing more of your adventures together and maybe I'll learn a few more curse words too. 🙂 I never rode a mtn bike til I came to Florida and I do appreciate how it cushions to blows when I ride over the roots and bumps at Circle B Bar Reserve. Hi Lori! I'm glad you found the blog. Enjoy! How do you deal with the added pressure on your wrists and shoulders from a mountain bike? That's my biggest problem. In Eugene, Oregon, most people seem to solve the problem of pressure on the wrists and shoulders by riding with no hands on the handlebars, even while riding in heavy traffic and talking on their cell phones.